The proven Vicks medication soothes and cools irritated throats helping to treat the cough. 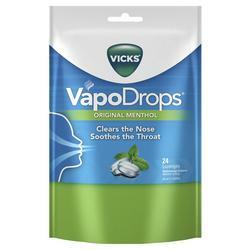 Vicks vapour action clears and cools nasal passages - fast. Vicks VapoDrops will quickly relieve the “throat tickle” that precedes a coughing fit and could prevent you from using your voice with confidence!